Back in April of 2015, we highlighted the inspirational story of Ian Clark, who hiked up Mt. Kilimanjaro to raise money for Water School – a charity that provides sustainable clean water strategies and education to developing countries. Ian was able to successfully complete the trek within 5 days, and proudly waved the .xyz flag at the top of the summit. Since then, Ian has been hiking all over the globe and recording his journeys. He needed a place where he could share these amazing adventures, so he created Hikers.xyz. Ian’s latest mission is to raise money for Nepal, which was recently devastated by earthquakes that affected over 8 million people. Ian and the Ontario-based group TrailHike will soon be embarking on an arduous 18-day journey to the Everest Base Camp to help raise awareness for the cause. Working through Samaritan’s Purse, their goal is to raise $15,000 for Nepal. The devastation in Nepal horrified us here at XYZ, and inspired us to donate to Ian’s worthy cause. We wish Ian and his team the best of luck on their adventure, and can’t wait to see what he has in store next. 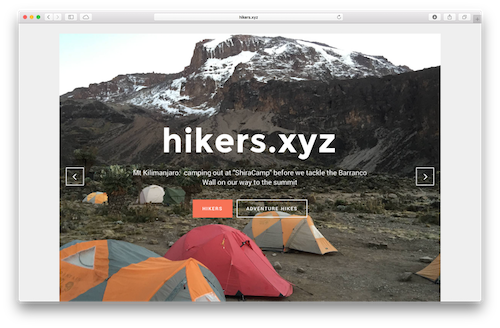 Fortunately, Ian will be updating Hikers.xyz directly from the trail, so be sure to keep an eye out for new pictures and videos of his journey. Update: As promised, Ian got back in touch with us before leaving on his journey to Everest. 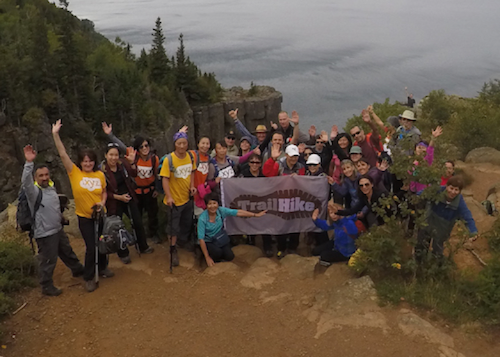 After chartering a plane into Northern Canada, he and 36 members of his Toronto based group TrailHike (which boasts a community of over 900 members) have just completed a training hike on the “Sleeping Giant” trail – and were looking great in their .xyz shirts. Ian and his 12 fellow hikers will be leaving tomorrow (10/7/2016) for Nepal. Along the way, they will be stopping in Hong Kong to hike to the famous “Big Buddha” statue, and Ian has promised us some exclusive updates. Also, be sure to check out Hikers.xyz, as Ian has updated the site to include a day by day recap of his hike across Ireland (and staredown with an angry momma sheep). Happy National Day, China! We hope you enjoyed the occasion with friends and family. But just because the official celebration is over doesn’t mean the celebrating is done. That’s why we have partnered with West.xyz again to host an exclusive .xyz auction next week. Starting on October 11th, there will be over 100 highly desirable LLL.xyz, LLLL.xyz, and NNNN.xyz domains available – all starting at 1RMB and with no reserves. That means great domains like TLC.xyz, HLA.xyz, 1887.xyz, and ZXXX.xyz will all have new owners by the time the last auction closes on October 18th! The best part of all is that ALL domains in this auction will renew for standard prices – NO premium fees! Check out a full list of the domains up for auction, as well as complete rules, at www.W263.xyz. Take me to the .xyz auction! BIG news coming soon! We can’t wait to share some BIG news with our followers in China next week that’s sure to get everyone excited. 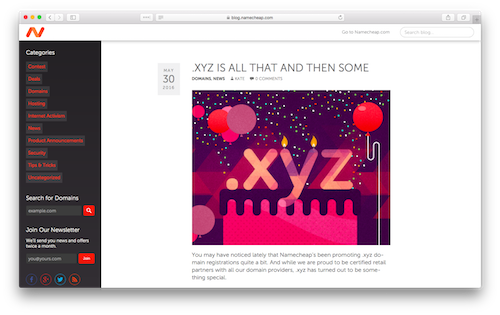 In the meantime, don’t forget to renew the coveted .xyz domains you’ve already acquired! 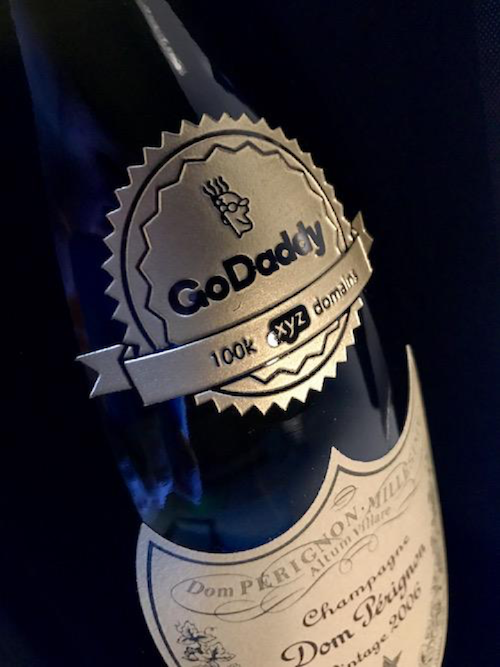 We’ve had a big year at XYZ and we’re glad we’ve been able to share our success with some good friends along the way, like GoDaddy. That’s why we’re happy to announce their recent accomplishment of reaching 100,000 .xyz domains registrations this week. 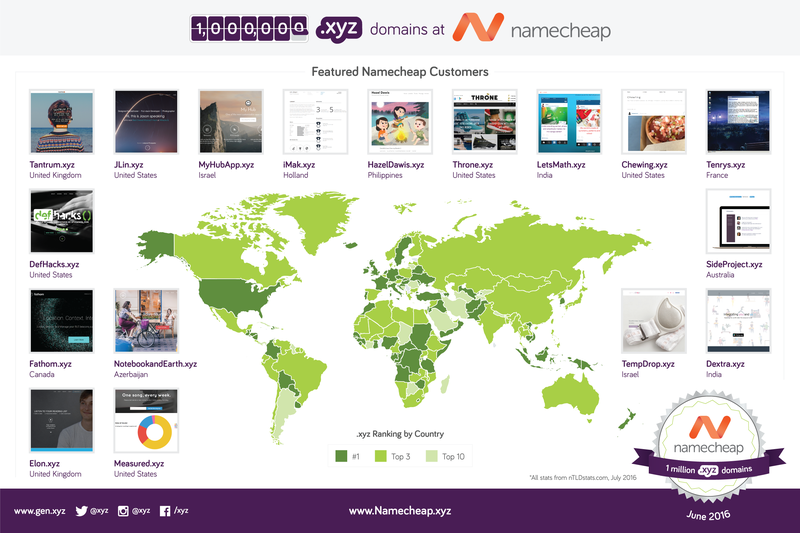 To celebrate, we are highlighting a few GoDaddy customers who have created some of our favorite .xyz sites. One of the best parts of discovering a new artist or song is getting the chance to share it with others. Before, this would mean splitting headphones or finding a link to send over. But with Lisn.xyz, you and your friends can enjoy a song together in real time – no matter where in the world you are. 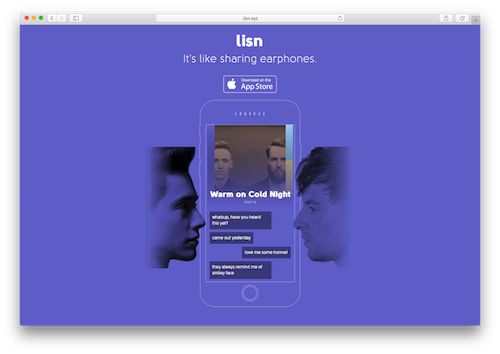 Lisn cuts out the hassle of sharing songs to friends by syncing the timing so you can enjoy the track together. 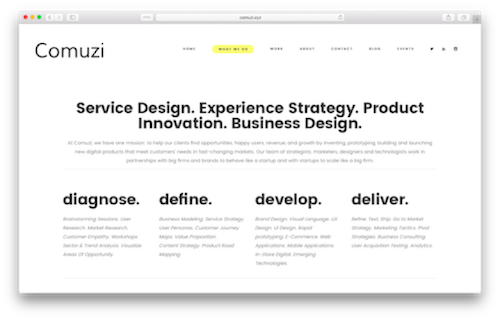 NDPM.xyz – GoDaddy customer (United States) NDPM.xyz is a site created by college student Patrick McHugh, using a clever four letter abbreviation meaning Indie Night (his personal branding) paired with his initials (PM – which also stands for “post meridiem”). Patrick uses his .xyz domain to showcase photos, drawings, and video shorts he creates – pulling inspiration from his journey into adulthood. NDPM.xyz is just another great example of how creative young members of #GenXYZ are exploring and sharing their passions with the world on short and brandable .xyz domains. As the internet and technology age grows, it seems to get harder to stay on top of the most recent trends or emerging techs. Brand experts Broadsuite Media Group (BMG) share this feeling, and that’s why they expanded their business with Converge.xyz. Converge acts as BMG’s informational resource – giving businesses the necessary insight into the ever changing market, while also developing strategies to help grow their brand and secure clients in the digital era. 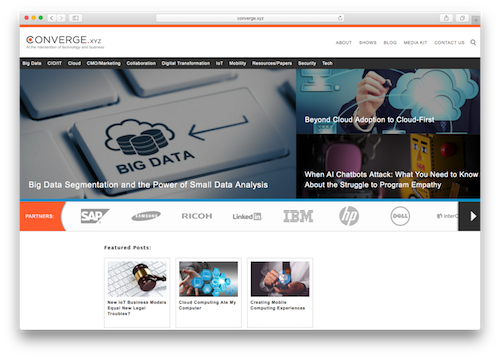 Among its roster of clients are SAP, IBM, Dell, LinkedIn, and YP. Converge practices what they preach by using @ConvergeXYZ across all of their social media handles to create a consistent online presence. Just like .xyz, Converge is educating businesses on new trends and strategies that resonate with the next generation of internet users. These GoDaddy customers illustrate exactly how .xyz is able to bring people together, whether it’s by sharing new music, your creations, or making the world a better place. We are proud to have GoDaddy as a partner, and we look forward in continuing to foster this community of innovators together. Tomorrow is the first day of Autumn, #GenXYZ! Taking a walk through the city in the cool air to see leaves changing colors is a great way to spend a fall afternoon. But what if there was a way to make exploring your town on foot even better? 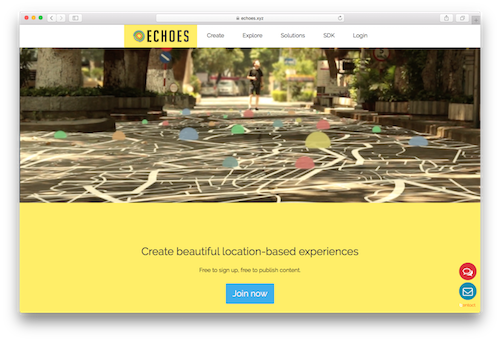 This week’s #WebsiteWednesday will enhance your walkabout by adding a whole new dimension: Echoes.xyz. Echoes is an app that turns your average stroll into a culturally immersive experience by using your phone’s location to trigger audio interactions connected to landmarks around you. As you are walking, “echoes” consisting of music, stories, and interesting facts relating to your surroundings will play. Not sure where to go? The echoes will guide you along your own private walking tour. For example, if you find yourself exploring a new city like Red Hook, New York, you can use the Echoes app to discover its rich history and unearth the unique quirks it has to offer. 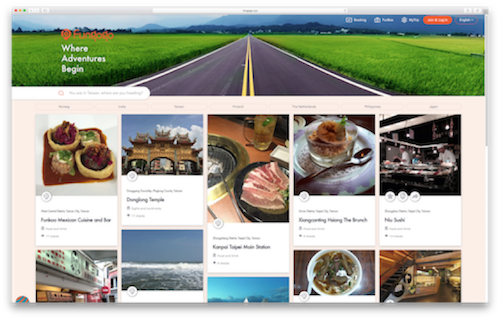 But perhaps the most innovative feature of Echoes is that it allows anyone to upload content, fostering a community of users that collaborate and share tours they’ve created. Users can add echoes through the Echoes.xyz website or on the app, allowing the community to interact with each other on the platform they are most comfortable using. Echoes also partners with towns to develop customized tours, extracting knowledge from the people who know them best. Our favorite example of this is an audio tour of Sussex, which highlights the city’s rich film history. The app ensures that your sightseeing adventure will be culturally enriching, educational, and unforgettable. Fittingly, Echoes was created through a community campaign launched on IndieGoGo that raised more than its financial goal. It also received thousands of dollars in funding from the Embassy of Denmark Cultural Development and Exchange Fund in Hanoi. 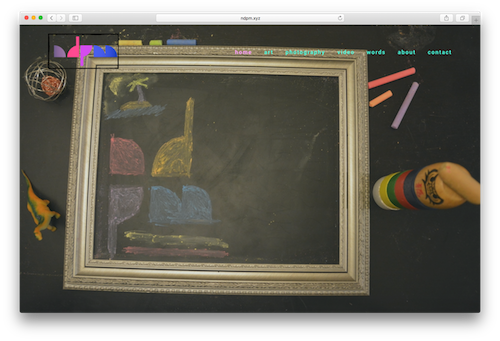 Echoes has taken the support they received in their initial campaign and created a truly inspiring augmented reality app. Just like .xyz, Echoes designed a platform which provides its international community of users an open space to educate and collaborate with one another. Their innovative spirit makes Echoes.xyz a great example of how #GenXYZ is using .xyz domains to connect with each other and create revolutionary new technology. One of the best parts about what we do is the traveling. The XYZ Team has been spotted all over the world, including Austin for SXSW, Helsinki for ICANN 56, and even China for meetings with our valued partners. Although we love being able to explore different countries and cities, planning trips is a tricky business. Choosing between hundreds of activities, coordinating flights, finding accommodations, and even deciding where to eat can quickly become stressful. Luckily, you can skip the hassle when planning your ideal trip with this week’s #WebsiteWednesday: Fungogo.xyz. 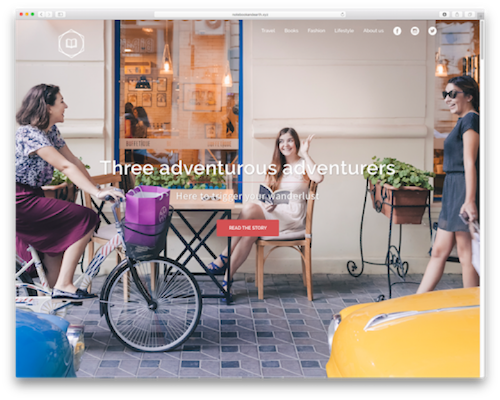 Fungogo takes the stress out of planning by providing travelers with tools to customize their trip, change plans on the go, and share their experiences with others. Their trip planner helps create custom itineraries based on popular destinations and users’ travel preferences. Fungogo also offers an app for both Android and iPhone, so unexpected changes don’t get in the way of having a great trip. Of course, the best part about travelling is meeting new people. Fungogo’s social feature, called the FunBox, allows users to share their experiences and connect with other Fungogo travelers if they want to meet up and enjoy their trips together. As Fungogo CEO Muriel Kuan explains, the current lack of travel services that help users easily plan and share their experiences is what inspired her to create Fungogo. “A vacation has so many things to plan and do at the beginning and end, and there isn’t a complete tool that allows anyone to accomplish all of these things. ‘Why don’t I use my own technical background to help solves these problems?’ I asked myself, and this idea gradually transformed into the one-stop travel community platform, Fungogo. We wanted to create Fungogo to be the Google AND Facebook of the travel industry! By satisfying jetsetters everywhere with an innovative trip planning platform, Fungogo is the perfect example of how #GenXYZ is disrupting their industries every day. If you’re like us and have caught the travel bug, don’t take another trip without using Fungogo.xyz! With adoption in 230 countries, .xyz is the platform for businesses and individuals to connect with their global audience on an international domain. But what if your audience doesn’t speak the same language as you do? Well, there’s a [Weebly] app for that now – and in this week’s #WebsiteWednesday, Martín Massera tells us how your message can be heard in any language with Multilanguage.xyz. 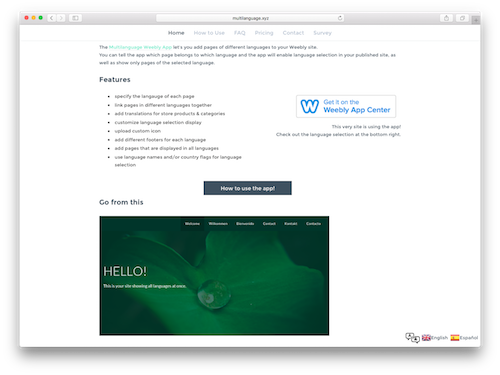 Multilanguage is a Weebly app that lets your visitors easily change the language of your website to the one that best suits them. 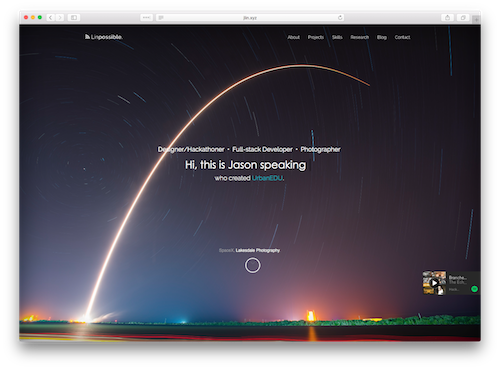 Their intuitive design allows for visitors to easily switch languages at the click of a button, while maintaining your website’s visual appeal. Multilanguage also works on mobile to ensure a great experience no matter what device your visitors connect from. XYZ: What was your inspiration to start Multilanguage? How do you see your app? I always saw the app as two things: covering a real need for users, and also as a channel of self expression. I expressed my values in the app, being as open, giving and carefree (not careless!) as I could. I deliberately let users extend their trial period as much as they need, and I give free accounts to all who need. Tell us about the reason you choose a .xyz for your domain? It has this thing about the alphabet, language, that goes well with the Multilanguage theme. It also sounds fresh, new. 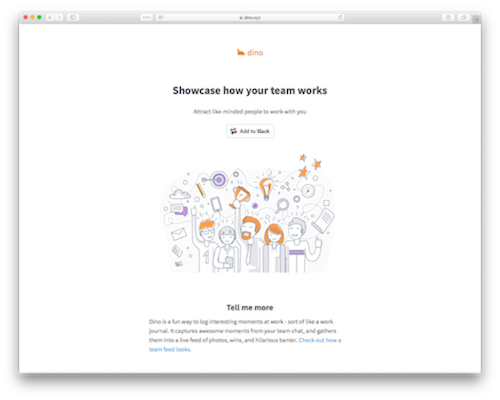 It’s not “techy”… I considered .io but I didn’t want Multilanguage to be a “tech startup,” I wanted to reach individuals and small businesses, just like Weebly. I’d love one of two things to happen: that we become the top reference for Multilanguage in Weebly, or that Weebly adopts Multilanguage into the platform itself. I just teamed up with a person in France to take the app to the next level. We are going to be working on usability, improving the user experience a lot, and also we are thinking about inline translations, as well as to offer automatic and manual translation services. The ability to communicate is crucial to building strong communities. Multilanguage.xyz connects you with people all over the world, regardless of what country your website comes from. Bringing people together by eliminating language barriers? Sounds like Martín is speaking our language! P.S. – Register your .xyz at www.gen.xyz and take advantage of our FREE Weebly website builder with your custom domain! We have started a new blog series to honor our loyal supporters in China. Click here to read the full post in English. Another themed auction success! Our 3-4 character .xyz themed auction has wrapped up and we want to provide our Chinese supporters with the highlights. We’re very happy with the results, and we bet the buyers are too! We’d like to congratulate the new owners of 181.xyz, 186.xyz, 182.xyz, and 299.xyz, which sold for 21,000RMB (~$3,148 USD), 20,000RMB (~$3,000 USD), 16,500RMB (~$2,473 USD), and 16,000RMB (~$2,399 USD) respectively. These NNN domains are rare and exclusive, so the winners really snagged some good domain names! Scroll down to view a list of auction results. This won’t be the last theme auction we are planning, so stay tuned for all of the upcoming .xyz exclusive auctions by following us at www.weibo.com/genxyz. Chengdu West, one of China’s largest registrars, recently soft launched their new international website for their English and international customers on West.xyz. With .xyz being the most popular new domain among Chengdu West customers, as well as internet users all over the world, they knew that West.xyz was the best URL for their business to expand globally. 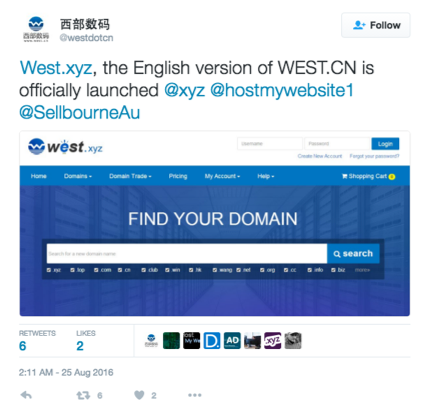 With more and more businesses adopting .xyz for their websites, it is great to see one of China’s leading registrars rebrand with West.xyz. With accreditation in China around the corner, we can’t wait to see many more Chinese .xyz websites on in the internet! For more information, visit DomainInvesting.com and check back later this week for the official announcement. Summer is ending and school is just around the corner. Thinking about the new things you’ll learn this year is exciting, but switching your brain back to school mode can be a challenge. Luckily, this week’s #WebsiteWednesday, LetsMath.xyz, will help get those gears turning again so you can get a head start this school year. 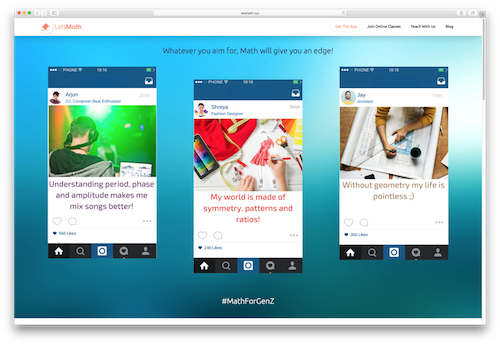 Based in India, LetsMath is an online learning platform that teaches #MathforGenZ with courses taught by experts who are available to give feedback to students 6 days a week. LetsMath lessons are self-paced and designed from scratch specifically for the digital generation. They’ve also created a mobile app, so students can access helpful feedback and lessons anywhere on a device they use every day. LetsMath exemplifies the innovative spirit of .xyz in the way they frame their concepts in real world situations that students can more easily relate to. By aligning their social media handles with their .xyz web address, they have made it easier for students to find their practice problems on channels like Facebook and Twitter. LetsMath is preparing students for a successful future by teaching them time-honored math concepts in an engaging way, and their .xyz web address is a perfect fit to connect with the next generation. Head to www.gen.xyz to get your own .xyz domain and share your knowledge with Generation XYZ!